Visible Ink Press : Which superhero is the son of an alien sent to conquer Earth? Which superhero is the son of an alien sent to conquer Earth? His Earth name is Mark Grayson. His superpowers include strength and the ability to fly. He joins the Guardians of the Globe. He engages in an epic battle against Omni-Man. Teenage superhero Mark Grayson is the title character of the Invincible comic book series, that was co-created by writer Robert Kirkman and is published by Image Comics. Kirkman, a prolific comics writer, is now perhaps best known as co-creator of the comics series about zombies, The Walking Dead (2003), which has been adapted into a successful television series on the AMC cable network. 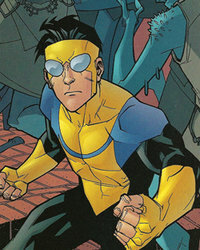 Invincible made his first appearance in another Image comic written by Kirkman, Tech Jacket #1 (November 2002). The Invincible comic book debuted in 2003, and was co-created by artist Cory Walker, who was succeeded by artist Ryan Davies in issue #8. Mark Grayson is the son of author Nolan Grayson and his wife Deborah. Nolan was really an alien from the Vitrumite race, who had become the superhero Omni-Man on Earth. When Mark was seven, Nolan revealed all this to him, claiming that the Vitrumites were a peaceful race. Eventually the superpowers that Mark inherited from his father emerged, including superstrength, superspeed, high resistance to injury, and the ability to fly. Mark became the Invincible, a costumed superhero, sometimes acting as his father's sidekick. But Omni-Man was actually a sleeper agent for the Vitrumite Empire, which intended to conquer Earth. Omni-Man finally began preparing the way for the Vitrumite invasion by murdering the members of Earth's superhero team, the Guardians of the Globe. Discovering his father's true mission, Invincible waged a tremendous battle against Omni-Man that devastated a city. Omni-Man nearly killed Invincible, but, unwilling to kill his son, instead fled from Earth. Invincible thereafter joins a new Guardians of the Globe and continues his superhero career. Kirkman co-created many other superheroes in the Invincible series. The original Guardians of the Globe parallel many members of the Justice League. Aquarus, a fishlike humanoid who was king of undersea Atlantis, possessed superstrength and could breathe in or out of water. The original Darkwing was a crime fighter based in Midnight City who costumed himself like a bird of prey. He lacked superpowers but instead relied on his skills as a detective, peak physical condition, and specialized weaponry. The Green Ghost swallowed an amulet that enabled him to fly and turn intangible. Martian Man was from Mars, and had shapeshifting powers, the ability to fly, and superstrength. The Red Rush was a Russian who could move at superspeed. The superstrong War Woman was a warrior princess from the mysterious "Other Realms." These characters evoke Aquaman, Batman, Green Lantern, Martian Manhunter, the Flash, and Wonder Woman, respectively. Omni-Man killed all the original Guardians except for the superstrong Black Samson, and the Immortal, whose regenerative powers enabled him to survive even after Omni-Man temporarily decapitated him. The Immortal does not age, is virtually unkillable, and has lived for millennia; he adopted America as his home, and even served as President under the guise of Abraham Lincoln! Black Samson and the Immortal both joined the second Guardians of the Globe. Among this second team's other members are Bulletproof, who is nearly invulnerable to injury; Dupli-Kate, who can create duplicates of herself; Monster Girl, who can transform into a superstrong monster; Rex Splode, who could cause inorganic materials to explode; a Martian shapeshifter called Shapesmith; and Shrinking Ray, who could shrink himself in size (and who was apparently killed). Another Guardians member, Robot, originally seemed to be a sentient robot. In fact, he was a deformed human genius named Rudy Conners, who operated a robot body by remote control. Conners has since transferred his mind into a cloned human body, which has an implanted device that enables him to control one or more robot bodies mentally. Dupli-Kate, Rex Splode, and Robot previously belonged to the Teen Team group. The Guardians recruited many new members from around the world in the 2010 miniseries Guarding the Globe. A video adaptation of Invincible, with highly limited animation based on the original comics artwork, was released in 2008 and has been telecast on the cable television network MTV2 and sold via iTunes.